[S290] 1860 U.S. Census, http://www.ancestry.com, Beaver Creek, Greene County, Ohio. [S264] John Langner, "Langner Email," e-mail to Carl J. Denbow, 13 Sep 1992. [S160] Interview, Richard Halley, 2008. 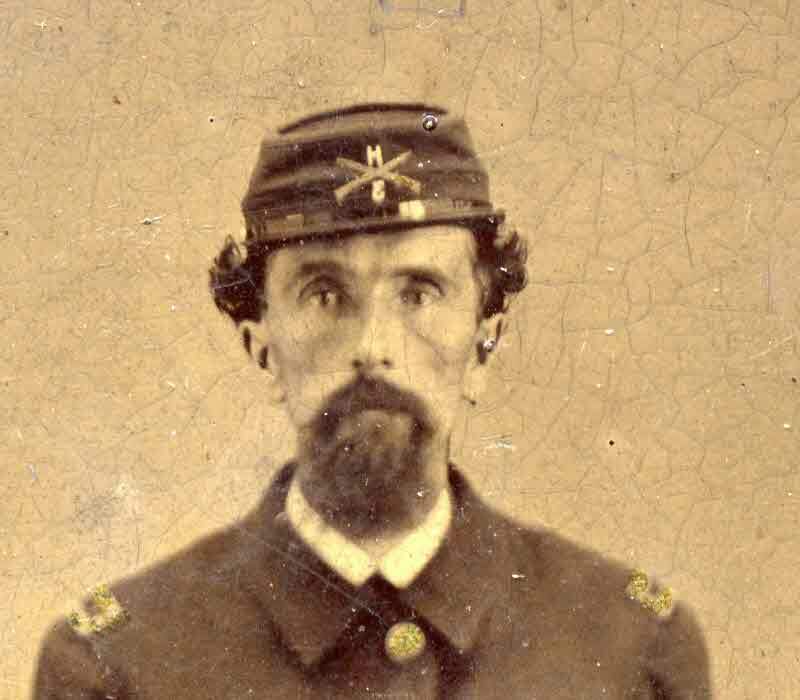 Levi Halley in Ohio National Guard uniform circa 1872 (mug). [S269] MC Vohris-Halley: documents county and date of marriage. 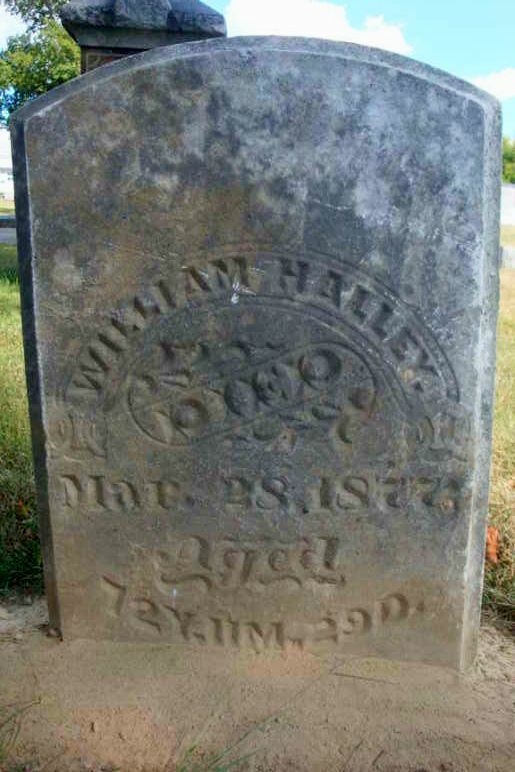 [S59] William Halley (b. 1804) Tombstone Photograph; online at denbowtree.org. [S265] FHL Film Number: 859283, Maryland Christening: This source not only confirms the birthdate and christening date of this child, but also the place of residence at the time., Aug 1833, Ancestry Online Files. 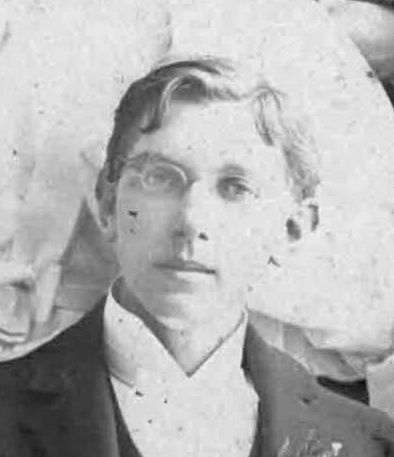 William E. Halley, Sr., as photographed at his graduatoion from Greenville High School in 1895. William Elmer Halley Sr. was born on 31 January 1875 at Coletown, Darke, Ohio, USA.1 He was appointed postmaster in 1908 at Greenville, Darke, Ohio, USA.2 He married D'Light Beatrice Devor, daughter of John Devor and Margaret Jane Kinneer, on 2 January 1909 at Greenville, Darke, Ohio, USA.3 William Elmer Halley Sr. was a self-employed coal dealer operating out of an office at 612 Huntington National Bank Building, on 10 August 1918 at Columbus, Franklin, Ohio, USA.1 He died on 18 December 1945 at Columbus, Franklin, Ohio, USA, at age 70. [S270] U.S. Government, Draft Regiistration. [S132] Staff writer, "WEH Biography." [S131] Certificate, Halley-DeVor marriage of 2 Jan 1909. Asmundur Hallgrímsson was born in 1820 at Iceland. Hannah Jane Hamilton was born on 31 January 1839 at Lewisville, Monroe, Ohio, USA. She was HOUSEWIFE. She married Charles Frederick Billmann, son of Niclaus Buelmann and Catherine Yost, on 8 March 1860 at Monroe, Ohio, USA. Her married name was Billmann. Hannah Jane Hamilton died on 20 February 1918 at age 79. John Hamilton was born in 1792 at Pennsylvania, USA. He Arrived in Ohio in 1815. He was buried in July 1854 at Lewisville, Monroe, Ohio, USA. He died on 24 July 1854 at Monroe, Ohio, USA. Agnes Hammond was born in 1880. She died age 80 years. She died in 1961. She was buried at New York, USA. Caroline S. Hammond was born in 1889. She Died age 79 years. She died in 1968. She was buried at New York, USA. Charlotte Hammond was born in 1884. She Died at age 80 years. She was also known as Charlotte Lovegrove. She died in 1965. She was buried at New York, USA. Elizabeth 'Lizzie' Hammond was born between 1876 and 1877. She According to the notes of Jean Reid Edwards, Elizabeth died in theAdrian Hospital at age 25 of a bowel obstruction. She is buried in theKnights of Pythias Cemetery on Twp. Road 460 near Punxsutawney, Pa. Itis a black top road 1/4 mile from Anita. Her grave is marked by aHammond marker. Book: Tombstone Hopping, Jefferson County,Pennsylvania, by Patricia Steele. McCalmont Twp., United BrethrenCemetery, Row 2, Lizzie Reid, wife of James, d. 9/19/1902, 25 years, 7months, 17 days. Obituary: Newspaper clipping in the possession ofJean Reid Edwards. Name and date of paper are cut off. MRS. JAMES J.REED Mrs. Elizabeth Reed, wife of James J. Reed, of Adrian, died lastFriday at the Adrian Hospital as the result of an obstruction to theintestines. An operation had been performed three days before, but thepatient failed to rally. The deceased was 25 years of age and leaves ahusband and two smll children. The remains were interred in AnitaCemetery on Sunday, Rev. Charles A. Clark, of Punxsutawney,officiating. She was also known as Elizabeth 'Lizzie' Reid. She died on 19 September 1902 at Pennsylvania, USA. She was buried at Anita, Jefferson, Pennsylvania, USA. Margaret Hammond was born in 1874. She Died at age 82 years. She died in 1956. She was buried at New York, USA. [S72] Ancestry.com, U.S. & Int Marriage Records: Source number: 420.000; Source type: Electronic Database; Number ofPages: 1; Submitter Code: CJD. (?) Hansen died in 1932. Christine Hansen Letter to Magnus Tadsen from Hans Hansen states Christine is not married. Place of Residence: Hanover, Germany. Hans Hansen See letter to Magnus Tadsen from Hans Hansen in notes for Magnus.According to the latter Hans has 2 girls age 19 and 25 at the time theletter was written right after World War 2. Place of Residence:Germany Severely wounded in Flanders in World War 1. Peter Hansen Killed in Russia In World War I. See Letter to Magnus Tadsen fromHans Hansen. 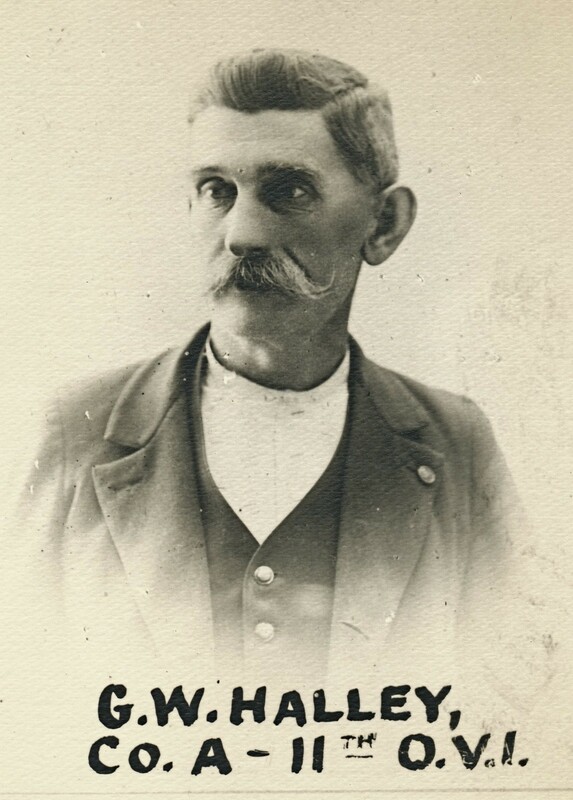 James Hargis was born in 1864. He married Julia A. Denbow, daughter of Elisha Denbow and Theodosia Reed, in 1889. James Hargis died in 1945. Anna Maria Harmes was also known as Anna Maria Rofkar. She died in 1870. She was buried at Ottawa, Ohio, USA. Ray Mckinley Harp was born in 1900. He married Annabel Lee Shrimplin in 1920. Georgia Ann Harper was born on 23 September 1874 at Bradley, Arkansas, USA. She married Jesse Wakefield Denbow, son of James Alexander Denbow and Seleta Elizabeth Davidson, on 12 November 1898 at Navarro, Texas, USA. Her married name was Denbow. 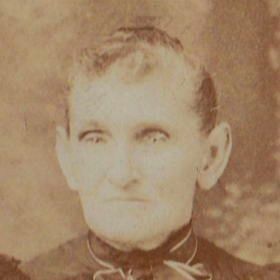 Georgia Ann Harper died on 5 October 1950 at Corsicana, Navarro, Texas, USA, at age 76. She was buried at Chatfield, Navarro, Texas, USA.